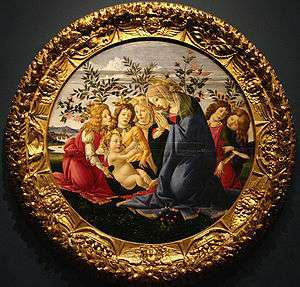 Madonna and five angels, Botticelli, c. 1485. A Marian devotion in Christianity is directed to the person of Mary, mother of Jesus. The term "devotions" is commonly understood to refer to those external practices of piety by which the faith of an individual finds expression. There is no single church with universal authority within the Anglican Communion; different types of Marian devotions are practiced by various groups of Anglicans with varying degrees of emphasis. Within the Anglican Communion and the Continuing Anglican movement, devotions to the Virgin Mary have more emphasis within High Church and Broad Church parishes than others. 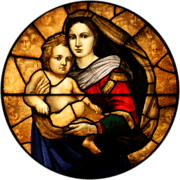 Stained glass depiction of Madonna and Child, St. John's Anglican Church, Ashfield, NSW, Australia. The emphasis placed on Mary and Marian devotions changed over the history of Anglicanism. 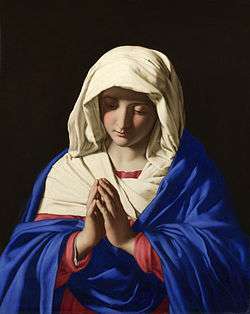 In the 16th century, following the independence of the Church of England from Rome, a movement away from Marian themes took place; by 1552 mentions of Mary had been reduced to only two or three times a day in the Book of Common Prayer but the Marian feasts of the Annunciation and the Purification had been retained. However, in the 17th century, there was a gradual return to Marianism and by 1662 there were five Marian feasts. British devotion to the Virgin Mary has often been expressed in poetry, Marian hymns, and Carols, e.g., in the 17th-century poems of John Donne and George Herbert, or in the 18th-century works of Thomas Ken such as Saint Mary the Virgin. Anglican devotion for the Virgin Mary was revived during the 19th century Oxford Movement of Anglo-Catholicism and by the activities of prominent figures such as John Henry Newman. British theologians such as Father Frederick Faber (who composed several hymns to Mary) took an enthusiastic approach to the promotion of Marian devotions towards the end of the 19th century. In the liturgical renewal of the 20th century, Mary gained new prominence, and in most Anglican prayer books she is mentioned by name in the Eucharistic prayers. The gradual increase in Marian devotions among Anglicans has also been manifested within the higher levels of the clergy in the Anglican Communion. Archbishop of Canterbury Rowan Williams (who made a 2008 pilgrimage to Our Lady of Lourdes) wrote a book on how to pray with the icons of the Virgin Mary. Anglican devotions to Mary include the Anglican Rosary (similar to the Catholic rosary), votive candles, and pilgrimages to Walsingham and Lourdes. Some Anglicans and Anglo-Catholics also pray the rosary itself. For centuries, Our Lady of Walsingham has been a centerpiece in Anglican devotions to the Virgin Mary and its feast is celebrated on October 15, as well as a Catholic feast on September 24. Also common in Anglican cathedrals, Anglo-Catholic parishes, and certain Anglican shrines are chapels or side altars dedicated to the Virgin Mary called Lady chapels. Discussions between Roman Catholics and Anglicans within frameworks such as the Anglican—Roman Catholic International Commission, and with the 2005 publication of the (non-binding) joint statement: Mary: grace and hope in Christ, have started a movement towards closer agreement of Mary and Marian devotions between Catholics and Anglicans. A deep devotion to the "Aeipartenos" (i.e., Ever Virgin) Mary is one of the key themes of Orthodox liturgy and spirituality. Devotion to the Virgin Mary is "taken for granted" in Eastern Orthodoxy. It permeates the entire life of the Church and historically required no academic development as in the Western Church. 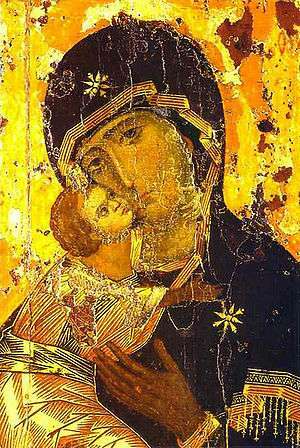 The Theotokos (i.e., God-bearer, or Mother of God) title for Mary is very important in Eastern Orthodoxy and is seen as an affirmation of the fullness of God's incarnation. Orthodox understandings of Mary have for centuries been mostly doxological and devotional rather than academic: they have been expressed in Marian hymns, liturgical poetry and the veneration of icons, rather than formal treatises. Marian devotions thus form the nucleolus of Orthodox Mariology. Devotions to Mary are far more ingrained and integrated within Orthodox liturgy than any other Christian traditions, e.g., there are many more hymns to Mary within the Eastern Orthodox yearly cycle of liturgy than in Roman Catholic liturgy. Feasts, icons and hymns are often combined, e.g., the Theotokos Iverskaya "wonder-working" icon is used on its own feast day, and the Akathistos is sung. The Orthodox focus on Mary as the Theotokos gives more emphasis to devotions that praise Mary's role in the mystery of Incarnation, rather than other devotions, e.g., those that consider her sorrows at Calvary. Devotions to the Theotokos are often combined with the veneration of icons depicting her with the Child Jesus. For instance, in the Sunday of Orthodoxy the singing of Marian hymns and the veneration of icons reaffirm the identity of Mary as the Theotokos. The Eastern Orthodox Church considers Mary to have been elevated by God to the highest status, above all other creatures, though still only a human being. The Orthodox hymn Axion Estin speaks of Mary as being "More honorable than the cherubim and more glorious beyond compare than the seraphim." Although most Orthodox consider Mary sinless, they do not accept the Roman Catholic definition of the Immaculate Conception of Mary. Mary is mentioned numerous times in all of the Divine Services and the Divine Liturgy. The final petition of each ektenia (litany) ends with an invocation of the Virgin Mary. When a series of troparia are chanted, the final one is often a Theotokion (hymn to the Virgin Mary). There are numerous Marian litanies in the Eastern church and may cover a multitude of themes, some dogmatic, others of moral and patriotic character. Devotions to icons of the Theotokos (often considered miraculous) are common in Eastern Orthodoxy. 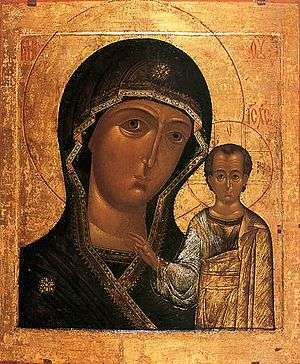 Many such icons are considered the protector of a region, e.g., Our Lady of Kazan, the Theotokos Fyodorovskaya as the protector of the Upper Volga region and the Theotokos of Tolga as the patroness of Yaroslavl. A number of local (and often ancient) Orthodox Marian devotions also exist around the world, e.g., to the icon of the Theotokos of the Life-giving Spring in present-day Istanbul. One of the most important Marian devotions is the Akathist to the Theotokos, which is chanted every year during Great Lent, and is frequently chanted throughout the year as a private devotion. Some people chant the Akathist as part of their preparation for Holy Communion. A metrical translation of an ancient Orthodox prayer is found in the second verse of the Anglican hymn, Ye Watchers and Ye Holy Ones. 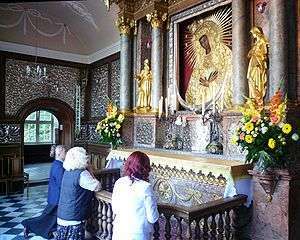 Praying beforeOur Lady of the Gate of Dawn in Vilnius, Lithuania. Practically all Marian devotions and pious exercises are in some way related to the liturgical feasts of the General Calendar of the Roman Rite or of the particular calendars of dioceses and religious congregations. Saturdays are dedicated to the Virgin Mary, designated as memorials of the Blessed Virgin Mary. This practice derives from Carolingian times (ninth century). The month of May has been traditionally dedicated to Mary. Christians have often conducted processions honoring Mary. These processions have been largely restricted to Catholic and Orthodox cultures since the 16th century. In Los Angeles, California, a Marian procession took place annually for about the first 100 years following the founding of the city in 1781. 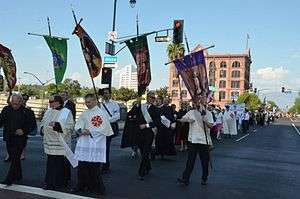 The Queen of Angels Foundation, founded by Mark Anchor Albert, revived this annual procession in September 2011 in Downtown Los Angeles, to coincide with the anniversary of the founding of the city. Doctrine-based: These include the defined doctrines of Mary as Mother of God, Mary ever virgin, Mary conceived without sin, Mary assumed into heaven. The devotions may precede the dogmatic definition of the doctrine. Such devotions can evolve over time, e.g., to the joint devotion to the Sacred and Immaculate Hearts of Jesus and Mary. and may even receive official approval, while others may be deplored: in 1677, the Holy See condemned the belief that Mary herself was virginally conceived, which had been an idea surfacing occasionally since the 4th century. There is also an interplay between these types of devotion, e.g., the apparitions of Lourdes emphasized the Rosary and those of Fatima reported the Virgin Mary with the Rosary and scapular. Regional devotions continue to generate local support such as festivals and celebrations. The festival of Our Lady of Solitude of Porta Vaga in the Philippines has been celebrated for centuries, and its icon continues to be venerated. Each year around Pentecost, as part of a local Marian devotion, about a million people attend the Romería de El Rocío in Spain. A street shrine devoted to the Virgin Mary in Montevarchi, Tuscany, Italy. ↑ "Catholic Encyclopedia: Popular Devotions". Retrieved 16 December 2014. ↑ "Introduction". Shrine of Our Lady of Walsingham. Retrieved 16 December 2014. ↑ Mary: grace and hope in Christ, pp. 7–10. ↑ "Liturgy of the Word in honour of the Icon of the Mother of God of Kazan - August 25, 2004". Retrieved 16 December 2014. ↑ "Lauds in honour of the Blessed Virgin Mary, before the ancient icon of Our Lady, Mother of God of Kazan". Retrieved 16 December 2014. ↑ Pope Paul VI. "Apostolic Exhortation Marialis Cultus". Retrieved 16 December 2014. ↑ Pope John Paul II. "Apostolic Letter Rosarium Virginis Mariae". Retrieved 16 December 2014. ↑ "Shrine of Gualdalupe Most Popular in World". ZENIT International News Agency. Retrieved 1 Oct 2010. ↑ "Our Lady of Siluva". Marian Library, University of Dayton. Retrieved 16 December 2014. ↑ Brother Anthony Josemaria, pp. 401-403. ↑ Directory on popular piety § 188. ↑ "Address to the participants of the International Symposium on the Alliance of the Hearts of Jesus and Mary". Retrieved 16 December 2014. 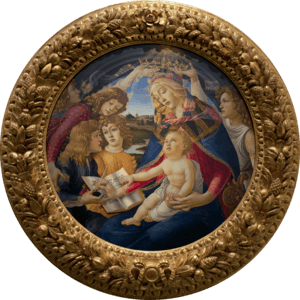 ↑ "Catholic Encyclopedia: St. Anne". Retrieved 16 December 2014. 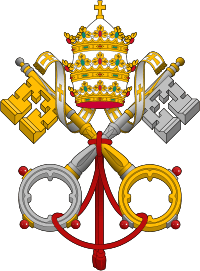 ↑ "Catholic Encyclopedia: Raccolta". Retrieved 16 December 2014. ↑ "Thousands of pilgrims throng Velankanni for Christmas". The Hindu. Retrieved 16 December 2014. ↑ "Address at Blessing of Marian Shrine (Lichen, 7 June 1999)". Retrieved 16 December 2014. ↑ "Catholic Encyclopedia: Scapular". Retrieved 16 December 2014. ↑ El Rocío, Rough Guide to Spain. Retrieved 2010-04-14. Archived July 15, 2011, at the Wayback Machine. ↑ Herbermann, Charles, ed. (1913). "Devotion to the Blessed Virgin Mary". Catholic Encyclopedia. New York: Robert Appleton Company.